3 whole weeks in beautiful Italy, it was now time to head to Gorgeous Greece. It is a 3-hr flight from Fiumicino Airport to Athens. At the time we visited Athens, the economy was rising to the height of its bankruptcy so we were greeted with a lot of rallies and strikes; it was petrifying but these didn’t stop the tourists from visiting. The weather was very promising compared to that of Italy. I was finally able to wear a dress! Despite the country’s situation, the city still put its best foot forward and offered us an unlimited experience. 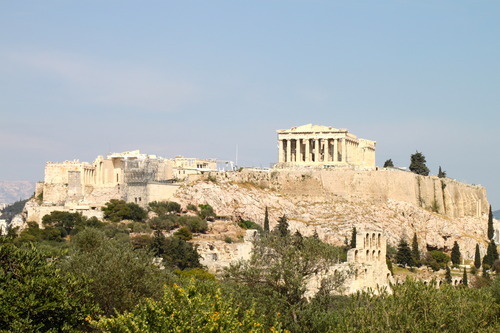 Athens is one of the oldest, greatest, historical cities in Europe. Just like Rome, as you walk along the streets of Athens, there are proofs of how great this city once was; every few meters you come across an Ancient monument. The city has clearly preserved its history and has unified it amidst the city’s modern day life. From the Airport, we took the X95 Bus to Syntagma Square and took a cab to our hotel, Joker Hotel, in Omonia where we stayed for 3 nights. It wasn’t the best place to stay at. The hotel is located in an extremely dodgy area of Athens with a lot of homeless people sleeping on benches just outside the hotel; it felt very unsafe, especially when walking around at night and there was no air-conditioning in the room, not that we needed it anyway. The person in charge didn’t even know how to speak English. I can’t complain, really, as we got what we paid for. I only have 3 good things to say about this place; 1) it served breakfast 2) it was a few meters away from the train station and 3) the room was pretty big. 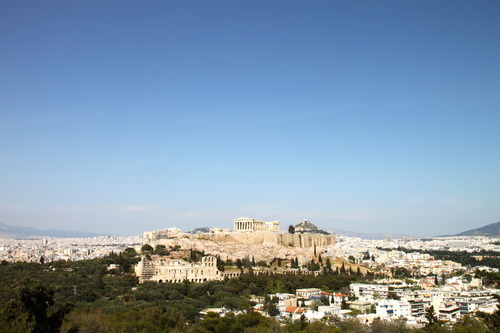 We were in this city for three whole days, which was enough time to really feel Athens. On the first day, we dedicated our day to exploring the historic center and the sites around the Acropolis. From Omonia, We took the train to Akropoli stop and explored the ruins of the great Acropolis, another UNESCO World Heritage Site. As we bought our ticket, it came with a little “buy 1, take all” surprise. For €12, the ticket is already packaged! Meaning, you buy a ticket for one monument, it includes most if not all the archaeological sites in the city. The ticket is sold at the entrance of any of these places – not bad, huh?